The Malaysian economy is undergoing rapid growth and diversification, meaning that there are plenty of opportunities here for a smart business to find a new market for its products. Make the connections you need with this Malaysia email database and get results! It can be a complex task to market your business in Malaysia. But the one thing that can get you off to a great start is having a the sales leads you need in this pre-built Malaysia mailing list. We have the email address list you need to reach the people who are most likely to want to buy your products and expand your business database. 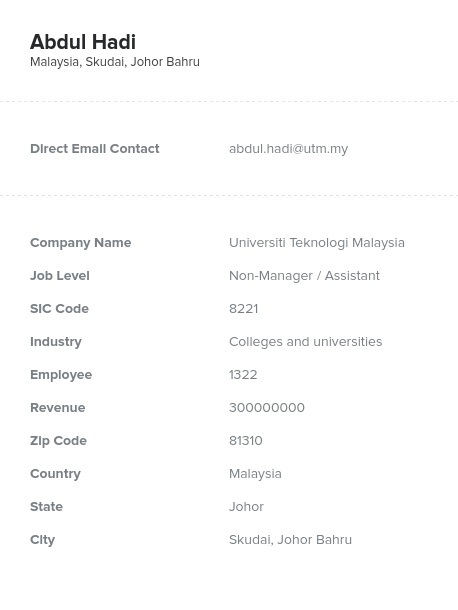 Our job is to provide you with a Malaysia email database that has real information you can use. That's why every Malaysia email list we sell is human-verified, so you know you can rely on its accuracy. Use this Malaysia mailing list and you know that your marketing materials will reach key sales leads in your target audience. We work to make undeliverable messages a thing of the past! Download this Malaysian email list to get the contact names, phone numbers, email addresses, and other accurate information you need to move your marketing plans forward. Or try out our online list-building tool to build a custom Malaysia mailing list that has the precise data you need, whether you're looking to talk to small businesses, executives in the petroleum industry, or B2B contacts in Kuala Lumpur. Either way, you'll have a head start on expanding your business.